The Hallmark Flowers Double Spike Pink Speckled Phalaenopsis Orchid always makes a wonderful gift that delivers a pop of color to decor. This 16-30-inch tall, 5-inch wide pink speckled orchid features 2 spikes and ships 75-80-percent in bloom with blossoms lasting up to 3 months. To care for your Hallmark Flowers Orchid, water with 3 ounces of cool water once per week and keep in bright, indirect sunlight preferably with east or southern light exposure and air temperature between 65-85 degrees Fahrenheit. Be careful not to overwater and don't let your orchid's air temperature fall below 55-degrees F. The Hallmark Flowers Double Spike Pink Speckled Orchid comes in an artistic white-colored ceramic container with a striped rim on the top and fits with any home or office decor. All Hallmark Flowers ship in a decorative Hallmark gift box with advanced packaging technology to protect the plant throughout shipping. Orchids are great gifts for just because gifting as well as holidays, birthdays, baby showers, teacher gift, thinking about you moments or any special occasion. Perfect accents for your home, a hostess, or a housewarming gift. 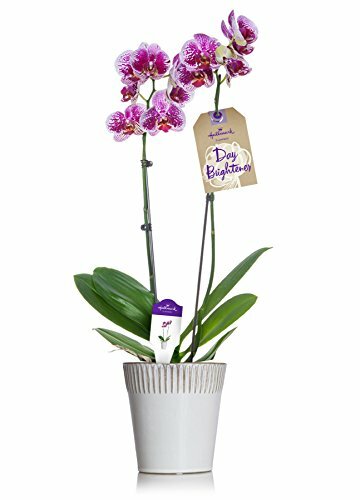 - Double spike orchids make great year-round gifts for all occasions including birthdays, baby showers, or thinking about you moments. Perfect accents for your home, a hostess, or a housewarming gift. - Enjoy beautiful flowers when the orchid arrives and watch it bloom for up to three full months with proper care. - This 16-30-inch tall, 5-inch wide double spike pink speckled Phalaenopsis orchid ships 75-80-percent in bloom. - The orchid arrives already in a 5-inch white-colored ceramic container with a striped rim on top. - Hallmark Flowers ship in a decorative Hallmark gift box with advanced packaging technology to ensure the plant's safety throughout shipping.